The ethical shopper is one who thinks about the social impact of the products they buy. They consider the environmental, social and economic consequences of the products, processes and brands they essentially invest in. Does the company have a good track record for how the treat employees (especially in developing countries)? Does the company use sustainable materials and processes? Does the company endorse fair trade and create positive social impacts in the areas they operate in? These are amongst the list of questions an ethical shopper might consider. There you go: ten principles that any shopper can follow in order to make informed and ethical purchasing decisions. All it takes is a mixture of education and research, in order to find the growing number of companies in the ethical and fair trade space. Also, don’t forget to never sacrifice style and quality in your hunt for socially-conscious deals. Last, a key part of the ethical movement is to the need to develop it further. So share your discoveries with your colleagues and friends (including this article!) and transform others into ethical shoppers too! Purchase often: Make sustainable purchasing a regular part of your consumer diet! Purchase ethical, purchase often, and share with your loved-ones and friends! This action plan was inspired by an in-depth series in The Globe and Mail about the state of charitable giving. To see their donation action plan, visit: http://beta.images.theglobeandmail.com/archive/01335/web_lf-givedonate-_1335629a.jpg. The recent recession has shown how corporate company budgets can tighten when it comes to philanthropy, in the face of budget cuts and a down market. Many companies are concerned that charities aren’t yielding the full benefits of non-cash resources that can be as valuable as money, when faced with recessionary pressures. This means that social change organizations need use strategic thinking by utilizing expertise, time, profile-raising, free advertising space, celebrity endorsement, and other gifts-in-kind, to raise awareness and create a positive impact. Experts argue that there is a “mismatch” between corporations and charities when it comes to the value of their partnerships. While companies see reputation and credibility as important components in their partnerships with charities, charities are more predominantly focused on seeking out money. Additionally, a strikingly large number of businesses believe that expertise and non-monetary resources will have a larger impact on their charity partner’s work, then pure donations would, while a significantly smaller number of charities agree with such a statement. There are a few examples of charities using donated resources such as call-centres or even manpower to raise funds or awareness for their causes – but are these enough? Or are these just a beacon for an increase in the value of in-kind donations to a charities mission? 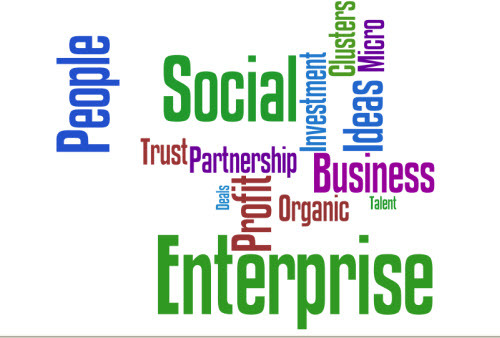 Perhaps this is the gap that social enterprises can fill. This lack of imagination in terms of how to harness a corporate partnership to complete a social mission can be address through social enterprises. Instead of having a strong focus on monetary donations (which have huge potential of being mismanaged, or not reaching the people or projects that need these funds), focusing on how to best use resources to create positive change (with or without the additional benefit of profit) is where social enterprises differ from many charities. Whether it is a social enterprise or charity, “resource-raising” is an important component that should be considered when planning the organization’s operations to generate income. By treating this as a component of the organizations core operations, considering the purpose and sustainability of the resources being used and being creative in the way that knowledge, skills, idea and influence is used – social change can be made more effectively and efficiently. Philanthropy in Canada is in the midst of unprecedented upheaval. An uncertain economy threatens to send already dwindling donations from an aging base of givers into permanent decline, while deficit-fighting governments are cutting their support and imposing tougher regulations on agencies that issue tax receipts for the money they collect. Shopanthropic is excited to announce our new Global Webinar Series on the sustainable and ethical retail space internationally. Our newly-launched webinar series will be hosted once a month. Over the course of the next few months, we will be engaging speakers from sustainable and ethical product companies and organizations around the world, to bring new perspectives and ideas for us to further the movement of sustainable/ethical products in the marketplace in Canada. Through a mix of talks, question/answer sessions and dynamic interactive experiences, we hope to shed light on ways to accelerate the ethical, fair trade and sustainable product movement in Canada. Our first speaker in this exciting series is Carola Reintjes, the Chief Executive of the World Fair Trade Organization (WFTO, http://www.wfto.com). With more than 25 years of professional dedication, she has a long record of work in Fair Trade and Solidarity Economy. She is founding member of the first Spanish Fair Trade Organization, co-founder and ex-President of the Spanish National Fair Trade platform and founding member and President of the national Solidarity Economy network (REAS) during the last decade. She was elected President of the newly established European branch of WFTO (WFTO Europe) till 2010. Her academic background is Philology (English/Spanish) and a Master in Environmental Management. She has an extended record of published articles and conferences, and is co-author of a book on Fair Trade certification systems. Looking forward to having you join us in this important discussion! It is the 59th year since the world started celebrating Universal Children’s day, taking place on November 20th – in hopes to create a worldwide fraternity and understanding between children. With an aim to promote the ideals and objectives of the UN charter, and the welfare of children worldwide, this day also marks the adoption of the Declaration of the Rights of the Child, in 1959, and the Convention on the Rights of the Child, in 1989. With the 2000 Millennium Development Goals (MDGs) encompassing goals such as addressing extreme poverty, halting the spread of HIV/AIDS and providing universal primary education by 2015 – there is a special focus on the importance of ensuring that our children have a bright future around the world. In celebrating Universal Children’s day, we should make sure that educate our children in how they can lead lives as responsible citizens of tomorrow. By teaching them values such as respect, acceptance, and guardianship towards ourselves, others and the environment, we are helping them achieve such goals. Through teaching them the importance of protecting biodiversity through sustainable materials, making ethical purchasing decisions and other such concepts – we are ensuring their well-being for years to come. Throughout the months of November and December we are offering some great incentives to purchase ethically-made gifts for your friends, colleagues and loved ones for coming festive season. From November 18th to December 24th we are offering 40% to 75% off every product available in our entire collection. Take advantage of this great promotion and purchase fair-trade or sustainable fashion and home decor that serve as excellent gifts for someone else or for yourself! Besides great discounts, you can enjoy free shipping on the purchases $50 and above. With products ready to be shipped within 24 hours – ensure that your gifts are delivered on time and with flair! Remember, with our products, you’ll help support those in need around the world and in your own backyard. One of our on-going fundraising campaigns is to benefit Earth Rangers. We are promoting a collection of kid-friendly journals and finger puppets to raise funds and 25% from each sale from this campaign is going to support the efforts of Earth Rangers in teaching children the importance of protecting biodiversity and inspiring them to adopt more sustainable behaviours. Want to save on shipping? We can arrange to deliver or pick-up in the Toronto downtown core! Contact us before placing your order and enjoy shopping in the convenience of your home. Our first speaker in this exciting series is Carola Reintjes, the Chief Executive of the World Fair Trade Organization (WFTO, www.wfto.com). With more than 25 years of professional dedication, she has a long record of work in Fair Trade and Solidarity Economy. She is founding member of the first Spanish Fair Trade Organization, co-founder and ex-President of the Spanish National Fair Trade platform and founding member and President of the national Solidarity Economy network (REAS) during the last decade. She was elected President of the newly established European branch of WFTO (WFTO Europe) till 2010. Her academic background is Philology (English/Spanish) and a Master in Environmental Management. She has an extended record of published articles and conferences, and is co-author of a book on Fair Trade certification systems. Join us on November 23rd, 2011at 10:30 am EST for our first ever Global Webinar featuring Carola Reintjes! Stay tuned for more information on how to view this webinar!